Good morning! 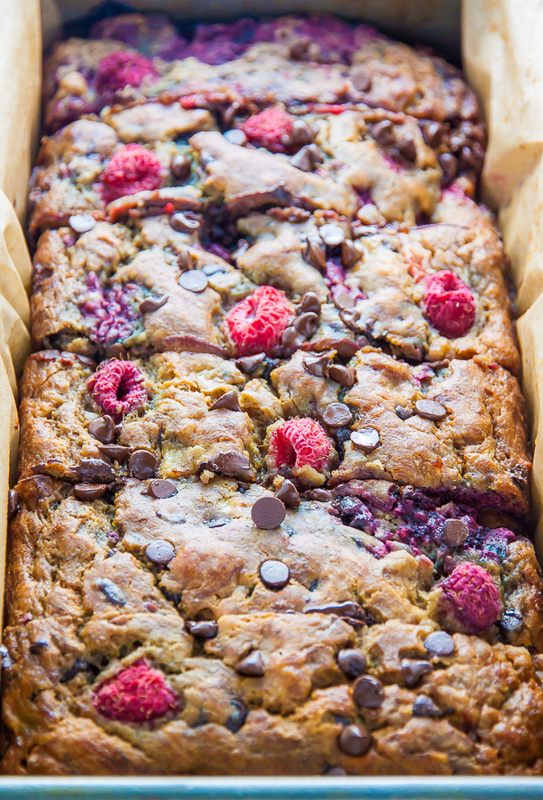 May I tempt you with a slice of this gorgeous banana and raspberry loaf? 1. 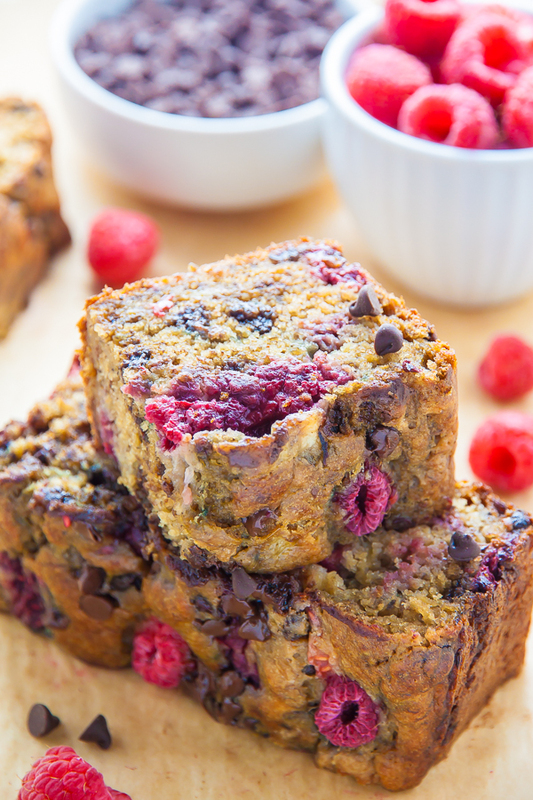 Be sure to use VERY ripe bananas as they add moisture and sweetness to this recipe. The blacker the better! 2. The chocolate chips are 100% optional! I love adding them, but if you’re looking to make this recipe healthier, feel free to leave them out, or reduce the amount called for. 3. I call for coconut oil in this recipe because it’s super healthy and I just love the taste and texture it gives the bread. If you cannot find coconut oil or have an allergy to it, please feel free to use a mild olive oil (or even canola oil) in its place. 4. 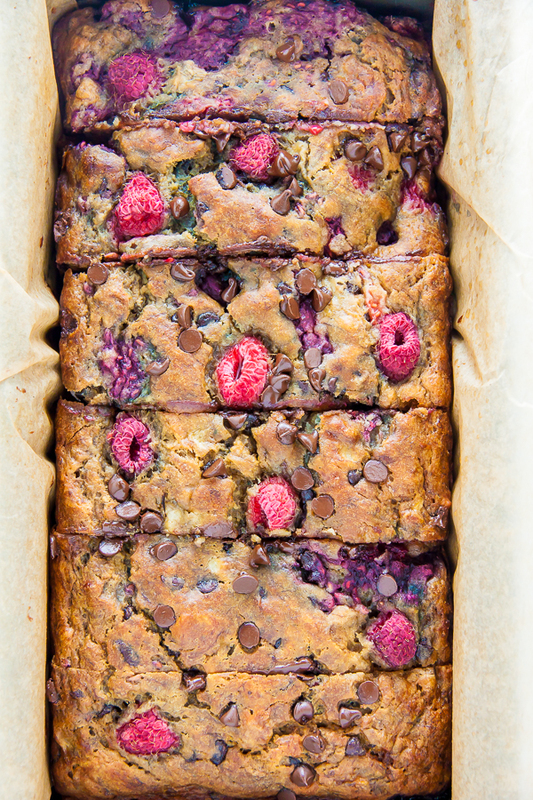 While I used fresh raspberries in this recipe, frozen raspberries may be used instead. Just be sure you don’t thaw them first. I should also add that while I find this bread to be an extremely healthy alternative to traditional banana bread, I’m not a nutritionist and am aware we all have different definitions of healthy. 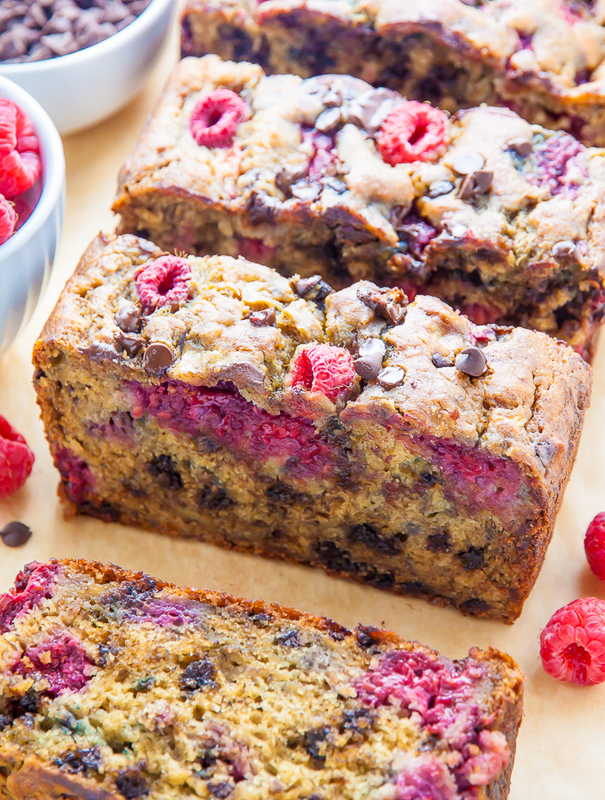 If you try this raspberry banana chocolate chip loaf recipe, let me know what you think! Leave a comment below, and don’t forget to snap a pic and tag it #bakerbynature on instagram! Seeing your creations makes my day. Supremely moist and Healthy Raspberry Chocolate Chip Banana Bread! Preheat the oven to 350 degrees (F). Line a loaf pan with parchment paper and lightly spray with non-stick spray; set aside. In a medium bowl, whisk together the flour, baking soda, baking powder, salt, cinnamon, and nutmeg; set aside. In a large bowl combine the sugar, oil, Greek yogurt, eggs and vanilla; beat until combined. Stir in the mashed bananas. Add in the dry ingredients and stir just until combined. 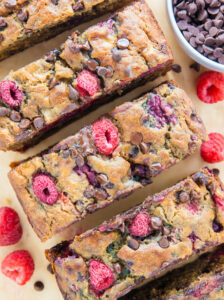 Fold in the raspberries and chocolate chips (if using). Banana bread will keep, stored in an airtight container or wrapped tightly in saran wrap, for 3 days. I made this loaf today, it was a total hit! I added chocolate chips of course. The cake is really moist and flavourful, everybody loved it. Plus, it is really easy and quick to make. Thanks for this great recipe! 1.- in this side of the world we use milliliter sand grams and I’m always trying to be very strict in measures. Would you recommend a good conversion site? 2.- what size of pan did you use for this recipie? As for my pan, I used a 9×5 loaf pan! Please let me know if there’s anything else I can help with. Happy baking! I saw this pic when you posted it on instagram and went straight to the supermarket after work to get raspberries. It turned out AMAZING, I made it without the chocolate chips. This week I’m making it again and bringing it to work. 3 out of 3 recipes from your blog so far and ALL 100% success!! Happy Collegues at work today!!! I’m sharing my recipe with them all encouraging them to bake. Could you use honey to replace coconut sugar? If so, how much? This looks,so amazing, I can’t wait to try it! Can you substitute regular plain yogurt for Greek yogurt? I made it for morning tea, it was amazing. Thank you. Would walnuts add or take way from the bread? I love win all breads but but can refrain if need be. Hi Paul. I think walnuts would be a fine addition! I would recommend a 1/4 cup or 1/2 cup maximum. Just made this and it turned out perfect! It is super moist and tangy – definitely a staple in our place from now on. Just made a double batch of this recipe. It is EXCELLENT! Very tasty and moist and somewhat healthy! You can’t tell that it has whole wheat flour. My family loved it! This looks delicious! But I was wondering if I could substitute the coconut sugar for regular sugar, and the whole wheat flour for all-purpose flour (white)? I did that and it worked fine. Can i make these into muffins? HI There, I haven’t tried the loaf yet as it’s only just come out of the oven, but it smells and looks delicious. Do you know if it can be kept in the freezer and later defrosted? Hi Kayleigh. Yes! I would let it cool completely, then wrap it tightly in saran wrap, then pop it in a freezer safe bag. It says 180 calories per slice. How many slices we loaf? Super recipe! It’s not overly sweet- the raspberry gives it a nice zing while the chocolate smooths it out. Yumm! 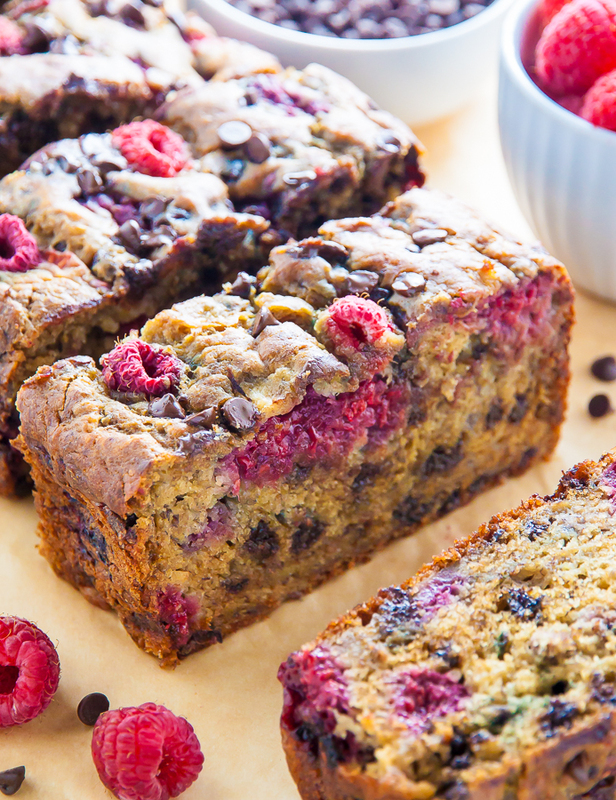 But then again, all of your banana bread recipes have been divine! Hey there! Can’t wait to try this recipe! Although i was wondering if it’s possible to replace the egg with something else? We’re vegetarian so don’t use eggs. Hoping you know a substitute – fingers crossed! Just made this cake and it’s crazily delicious. 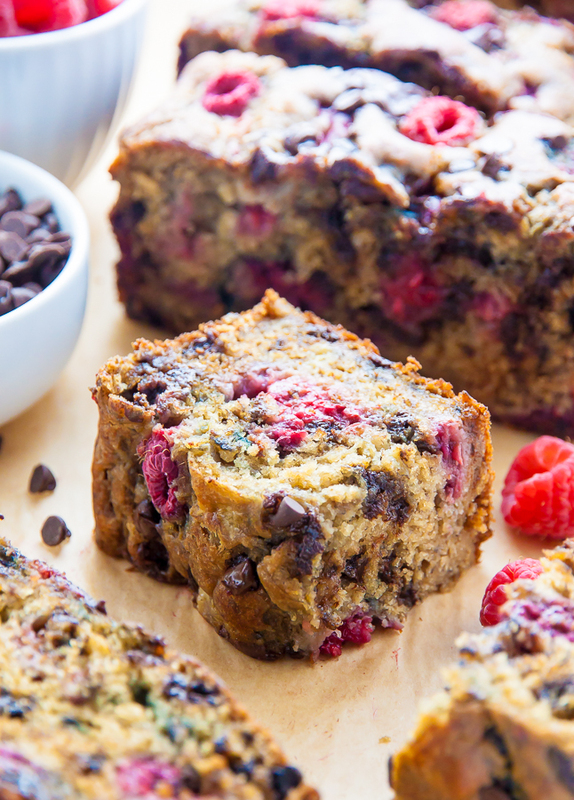 Didn’t use chocolate chips, substitute coconut sugar with raw sugar cane and Greek yogurt with fat free milk with juice of one lemon. The raspberry give the additional sweetness, the cake turn out moist. My husband is not a big fan of banana cake but he had three slices already. This recipe is a keeper. Best banana bread recipe I have tried! Loved it, delicious! This recipe is delicious. I was eating some when a friend arrived and she thought it looked super delicious too so gave her a piece, so have shared the recipe with her. I made it with blueberries instead of raspberries as I didn’t have raspberries. Imagine having a mix of both in it! Yum! Found your recipe via Pinterest. Hi there, I’m really looking forward to trying this recipe but I’m just wondering if your suggested oven temperature is for fan forced or conventional? I’m in Australia, not sure if that makes any difference, except obviously for converting to F to Celsius?! Thank you in advance!! Can I use or substitute Almond flour for this recipe? This looks so good! I’m wondering though if there is anything I could sub the greek yoghurt out for?